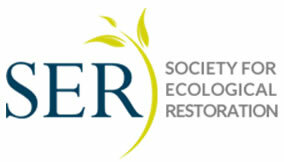 CEER 2014 organizers have implemented an awards program to recognize individuals who have made significant contributions to ecological and ecosystem restoration. Anyone may nominate an individual for an award; however, the award recipient must attend the conference. Winners will be notified by June 6, and they will be provided with a complimentary registration to attend the conference. (NOTE: Winners are responsible for their own travel costs.) All awards will be presented during the Closing Plenary Session on Friday, August 1st. 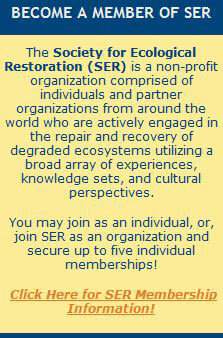 This award honors individuals whose sustained accomplishments throughout their career have made important contributions to the understanding and practice of ecosystem / ecological restoration. The individual should have more than 25 years of experience working in their field. Prepare a letter describing major highlights of the nominee’s qualifications and experiences and obtain their resume/CV. The nomination letter and resume/CV should not exceed ten pages in total. Please include the nominee’s name, title, organizational affiliation, phone numbers, and email in your letter. Up to five supporting letters from colleagues, supervisors, and/or community leaders/members may also be included, but are not required. Supporting letters should not exceed two pages each. All nomination documents should be combined into a single file in Adobe PDF format, and uploaded via the online submission form by the May 16 deadline. This award recognizes an individual in the early stages of their career who have demonstrated great promise in the field of ecosystem / ecological restoration. The individual should have no more than seven years of experience working in their field. Prepare a letter describing major highlights of the nominee’s qualifications and experiences and obtain their resume/CV. The nomination letter and resume/CV should not exceed ten pages in total. Please include the nominee’s name, title, organizational affiliation, phone numbers, and email in your letter. In addition, you are encouraged to submit one or two supporting letters from colleagues, supervisors, and/or community leaders/members recommending the nominee as a recipient of the award. Supporting letters should not exceed two pages each. No more than three supporting letters may be submitted. All nomination documents should be combined into a single file in Adobe PDF format, and uploaded via the online submission form by the May 16 deadline. This award honors an individual, or organization, having made substantial contributions to the dissemination of the theory, practice, and public awareness of the importance of ecological / ecosystem restoration. The nominee must have used a widely disseminated form of communication that highlights the importance of ecosystem / ecological restoration for the greater public or increased public awareness and acceptance of ecosystem / ecological restoration. Prepare a letter describing major highlights of the nominee’s qualifications and experience, and provide examples demonstrating their excellence in the use of public communication to disseminate the importance of, and public awareness of, restoration. The nomination letter should not exceed five pages. Please include the nominee’s name (or organizational point-of-contact), organizational affiliation, phone numbers, and email in the letter. Nomination packages should be combined into a single file in Adobe PDF format, and uploaded via the online submission form by the May 16 deadline. Supplemental evaluation material (print, video, or audio) may be requested by the CEER Awards committee after receipt of the nomination package. Robert Daoust| ARCADIS U.S., Inc.